Almost all of the tomes are improving. There are many worthy presents (I did not buy “Great Irish Lives” myself), a few bookclub books I still haven’t finished (“33 Moments of Happiness”, I have been looking at you since 1998) and things I found in the bargain basement in Hodges Figgis that I knew, even at the time of purchase, were going to prove challenging (“Ladysmith”, really, why?). I aim to polish them all off. Except for “Map of the Nation” which is Mr. Waffle’s and I am not going to read it, I know my limitations. And Saki, Father Brown and Myles are what I read at night when I have nothing else on and they are going to stay there forever but everything else is fair game. Ooh, start with the Amy Tan! Love. 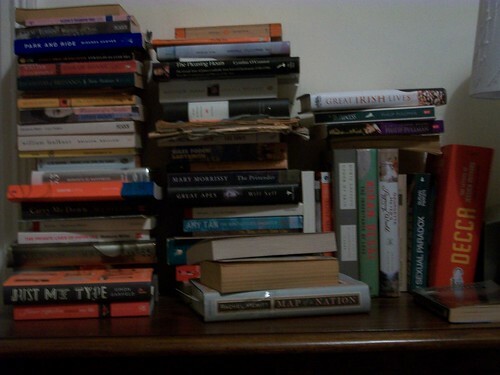 And, funny, when glancing around the pile, seeing titles sideways and with a little bit of blur, at first I thought that Sexual Paradox said Sexual Handbook. Ha! And what was my instantaneous thought? Brave woman, I think I would have been less than honest about the contents of my “to-read” pile and scooted that out of the picture. 🙂 Sexual Paradox sounds much less, um, instructive. So, not embarrassing, if you follow. I have finally finished AS Byatt’s The Children’s Book (don’t try, it’s not worth it). Now I can start on my Christmas presents – The Martin Beck series and the Wallander series. I have until March 31st, which is when the last Wallander novel is published in english. I’m currently on the second of the four “Tuesday Next” series by Jasper Fford (hilarious!). I have downloaded the first “Outlander” book by Diana Gabaldon, all three “Scarlet Pimpernel” books, some RLS and P.G. Wodehouse to my Kindle. I’ve got the second 10 Terry Pratchet “Diskworld” books in the queue (I’ve finished the first 10) as well as three books by Kazuo Ishiguro, including “Never Let Me Go,” the one they just made a film off. I figure that’ll do me at least til the end of February. . .
Kara, how delightful to hear from you. I too was thinking about you in what can only be called delightful symmetry. I was listening to the latest American Life episode and thinking that without doubt this was the best thing that had been recommended to me on the radio ever. Such was my enthusiasm that I was going to email you and ask for further suggestions. But you have pre-empted me – the politeness of North Americans continues to be a source of wonder. I will go to it. I might start on the Amy Tan too. Excellent advice Sarah, C, will skip AS Byatt. Very wise. WOL, in an example of shameless namedropping I can tell you that my sister-in-law used to be an editor at Hodder and I got all of the Jasper Fforde books free in consequence. It’s all glamour here. She says he’s a very nice man too. I loved them at first but in the end, I just got a bit tired and confused. Love Discworld too. Curious about Diana Gabaldon, haven’t heard of her. The Kazuo Ishiguro book is really terrific, I think. My favourite book of his – really curious to see what they will do with it for the film. CAD, do read The Children’s Book and tell me I’m an idiot. Maybe I missed the point (I struggled to find one…). Will do! I read Possession and Babel Tower, eons ago, and liked them, in so much as I understood them. First I have to deal with The Room for book club!